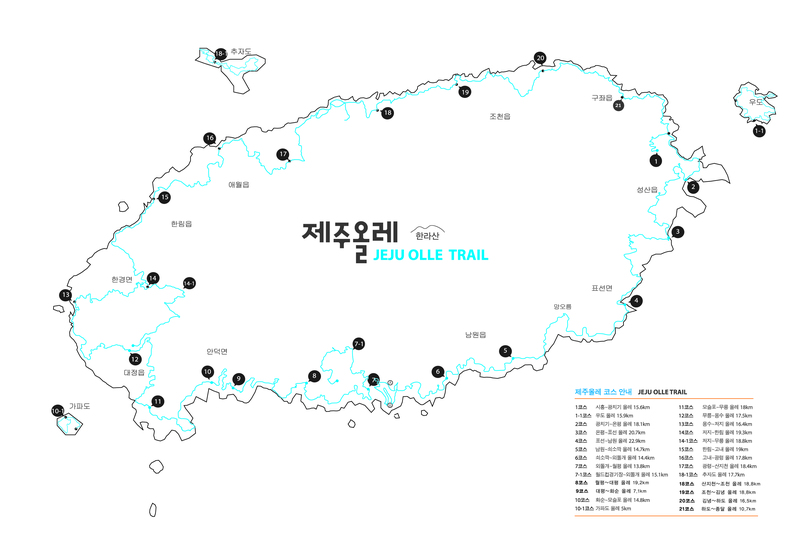 You can begin your Jeju Olle Trail walk directly from Jeju International Airport. Jeju International Airport has a connecting, officially marked trail, with Route 17. Route 17 continues into Jeju City and is a good way to start your walk transport free. There is a trend among international walkers coming to Jeju Olle Trail. Many are choosing to start at Route 18 in Jeju City and not Route 1 in Siheung-ri. So if the time of day is right, why not start walking as soon as you get off the airplane? Doing it this way should be a great introduction to South Korea and Jeju. Walkers really make it a ‘walking holiday’. Walkers will pass the official Olle information center, Ganse Lounge, in Jeju City and can pick up passports, food, and drink there. Walkers will go through Dongmun Market. Walkers can make a reservation ahead of time for accommodation in the area (there is a lot). The whole area near the Route 18 start point has restaurants and food supplies to get you ready for your first full day on the trail. The following day walkers can continue on Route 18 or instead take a bus on to Route 1.